Dwain Chambers 6.42 Mens 60m - What's a Good Time for 100 meters? Dwain Chambers 6.42 Mens 60m – What’s a Good Time for 100 meters? First, Congratulations to Dwain Chambers for winning the 2009 indoor Euro Championships 60 meters. Whether he is clean or not is NOT is the topic of this article. You can buy his book and come to your own conclusions. His winning time didn’t impress me as compared to his 6.42 semi-final race. Anytime you get within 0.03 seconds to Maurice Green’s 6.39 WR, that raises some eyebrows. If you can remember Dwain Chambers’ previous running style, he was very muscular (maybe too muscular?) and was always trying to muscle his way through his races. But being the semi-final, where you can be more relaxed, it often amazes (surprises?) me how fast you can run when in the lead and relaxed. Just ask Mike Marsh at the 1992 Olympic 200 meter semi-finals! His start, in particular his first 10 meters, also reminds me of Armin Hary. The start sets you up for the entire race. Take a look at the video below on YouTube and you can see a huge difference compared to his BALCO days. I wish they had an overhead shot of Dwain, as you can see his shoulders rotate about an inch or two, which would give an extra inch to his hips, and therefore an extra inch to each stride. Charlie Francis mentioned this years ago on how you can can gain a free meter by adding once inch to 45 strides. A one meter savings is about 0.10 seconds. You can talk all you want and hypothesize a 60 meter to 100 meter extrapolation. Does a 6.42 convert to a 9.70? Based on previous world records, a conversion of 1.53 or 1.54 would give you approximately 9.82 – 9.89. Still pretty impressive, but no 9.69 which is what the whole world wants to see. At least to non-track fans where the only thing that matters is a world record. Women’s athletics have it tough with so many records out of reach from alleged drug use. The Pole Vault and 5000 meters are the only events where records are being broken. Forget the 100mH-100-200-400-800 and forget the 1500-3000-10,000 meters. Even a 2.09 HJ or 7.52m LJ can make Men green with envy. Financial incentives for breaking world records will be tough for the ladies! READ Do You Catch on Fire When You Run? Dead on with the shoulder rotation. USATF thinks the hips initiates movements. The start does set up the whole race, I don’t think a lot of people understand how it sets up the race, as too many sprinters are stuck on exerting more and more force out of the blocks. Watch the race and see how DC takes off at about 30m when the other sprinters are just pumping the arms as fast as they can. Look at all the movement in the shoulders, that goes against current school of thought on shoulder movement. The NLAAF Running Manifesto mentions shoulder rotation and spine elasticity as a way to run, sprint and hurdle faster. 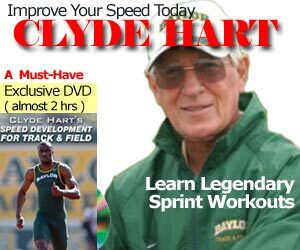 It also contains more forward thinking and innovative ways to improve running and sprinting. I am glad they should video footage from the front. Also anyone look at Usain Bolt and how he rocks from side to side when sprinting, due to shoulder rotation. The question of the day would be how; how to get the shoulder more involved and leading the sprint action without overdoing it? @adarian – my guess is the hands control the arms, and there for shoulders. Then the hips will follow. Why does Bolt not do the 60m? He has no reason to run it. It doesn’t seem to be a part of the training plan. @Rich – would you pay a man $250K to run for 6 seconds? speedendurance.com has stepped it up. 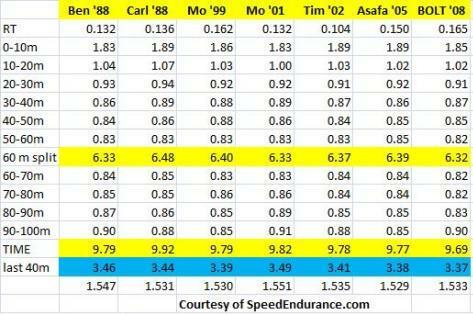 great video and the chart on the sprinters is great.